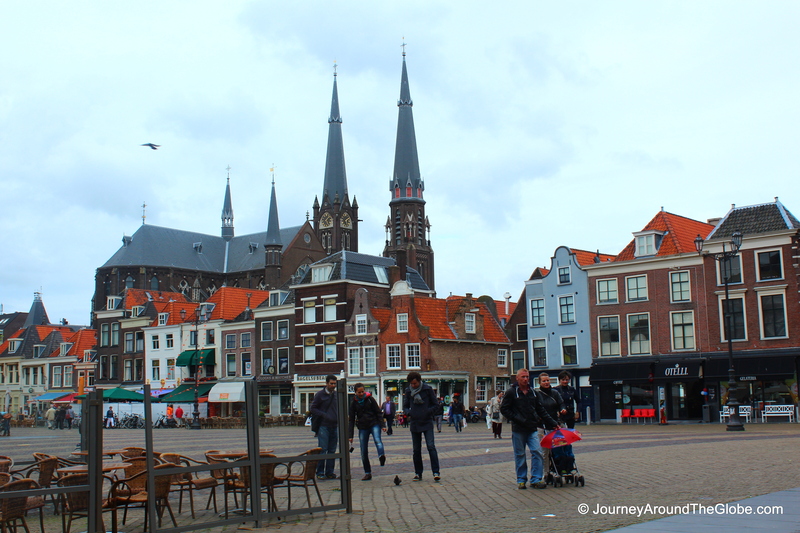 DELFT, THE NETHERLANDS: Delft is the type of city where I don’t mind going over and over again just to hang out and enjoy Dutch people and their culture. Yes, it is a typical Dutch city… meaning small canals running thru the city, old windmills here and there, cheese stores (one of my favorite features of Netherlands), and not to mention the crazy bikers. It is not a heavily touristic city, like Amsterdam, but the charm here is no less than Amsterdam. This small town is world famous for its history, famous University (TU Delft), and its tradition with blue and white ceramics. Even if you are not into ceramics, you will love watching master painters working on their projects and how they have kept their traditions alive over the centuries. Delft is also very close to (less than half an hour drive) Rotterdam, Gouda, Leiden, Dan Hague…perfect to combine these places. TIME OF TRAVELLING: This month my sister and her husband came to visit us from the USA. They’ve visited Amsterdam before. Delft being only hour and half drive from our home in Tervuren, Belgium, Delft was where we wanted to go before their flight back the next day. Although it was almost mid-June, it was a windy and cloudy day, no sun at all. WHAT TO BUY AND EAT IN DELFT: The most memorable (and expensive) souvenir you can buy from Delft is of course the blue and white Delftware. If you want to be cheap or don’t care about real stuff, you can get these ceramics in replica items in any store in the old town. But if you want real hand-painted Delaware made in Delft, then you gotta empty your pocket bad. But hey, who knows when you will go back there again…so why not get the authentic Delft porcelain for some a lot more extra cash? Other than that, you will find wooden shoes, tulips, Dutch cheese, miniature windmills in almost all the souvenir shops. If you want to try typical Dutch dishes, have a raw herring fish sandwich with onion, or battered deep fried fish. You will usually find people selling these in the open marketplaces on weekends. We had our lunch in a restaurant little bit outside of the old town. I had a croquette (kroket in Dutch), which is a deep fried Dutch snack prepared with minced beef, potato, and breadcrumbs. It looked like a hot dog when the lady put it on a bun with ketchup and mustard. PLACES WE VISITED: We spent about half a day in Delft, mostly in the old town. I just wish the weather was more favorable. If we had more time we could have check out some other famous pottery places in town. Another fun thing to do in this town would be taking a boat tour around the canal, which we didn’t do this time. 1) ROYAL DELFT (KONINKLIJKE PORCELEYNE FLES): Royal Delft, established in 1653, is one of the original 32 Delftware manufacturers and is the last remaining Delftware factory from the 17th century. 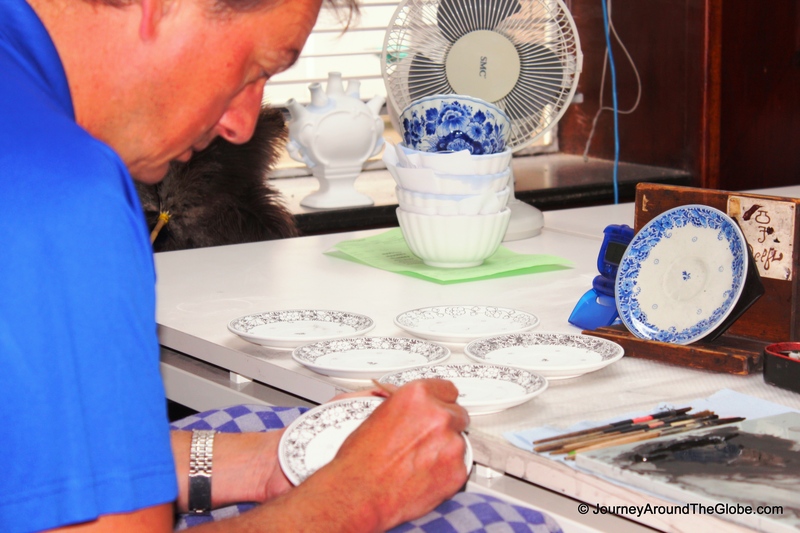 The world famous Royal Delftware is still entirely hand-painted according to centuries-old tradition. Royal Delft is about 20 minutes of walk from Delft Stadhuis or New Church. It is open every day from Monday to Sunday and all public holidays from 9-5pm (closed on Sundays and public holidays from November to March). There is an entrance fee of 12 euros per person to enter the factory that includes an audio tour (available in 8 different languages). The tour starts with 2 short films (1st one is the history of Blue Delft and Royal Delft and the last one is more like an interactive movie on its development and production process). 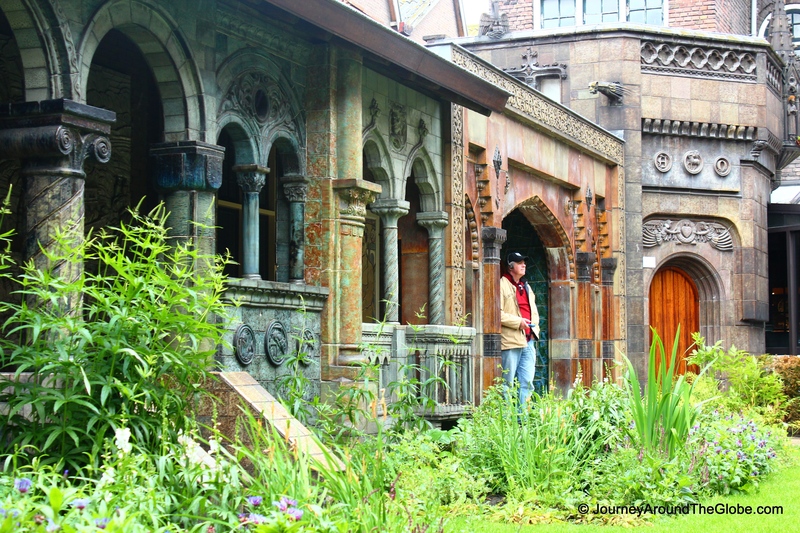 After that you get to see the master painter at work, antique Delft pieces, building ceramics, ceramic tiles, one of a kind courtyard, the factory and finally their showroom. The museum also features a collection of Delftware that was owned the Royal Dutch families. 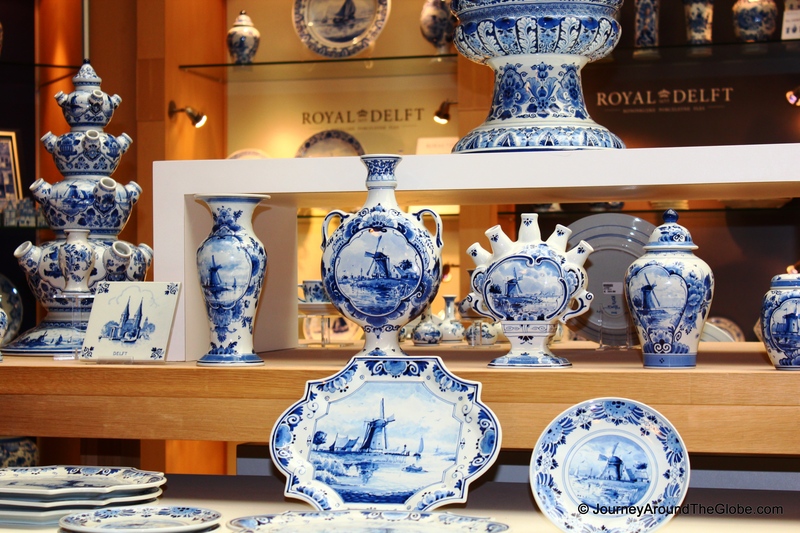 Good part about the showroom is that while it has a comprehensive collection of hand-painted Delft Blue by Royal Delft, it also carries an extensive selection of earthenware and souvenirs from other Dutch companies. There are other stores in the old town which sell Royal Delft products and what I have seen, prices are the same. 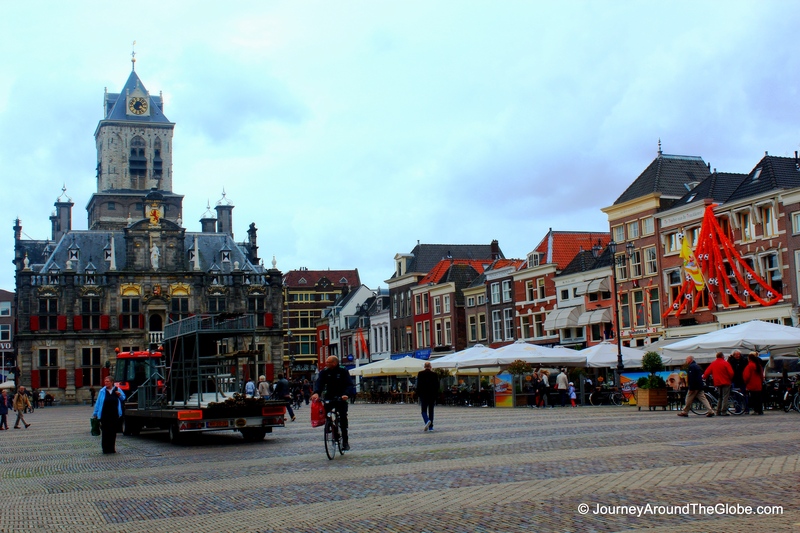 2) TOWN HALL (STADHUIS) & HUGO de GROOT MARKT: Delft Town Hall is located in the heart of old town, surrounded by many old buildings, Blue Delft shops, cafes, and other souvenir stores. Facing the town hall is a big bronze statue of Hugo Grotius (1583-1645), a jurist in the Dutch Republic. 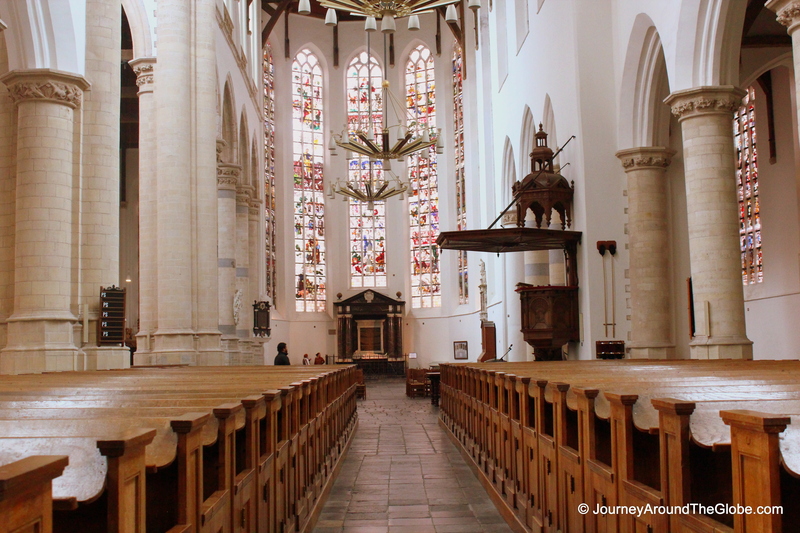 3) NEW CHURCH (NIEUWE KERK): New Church was built between 1383-1510. Its present spire dates from 1875 and is 375 ft. in height. 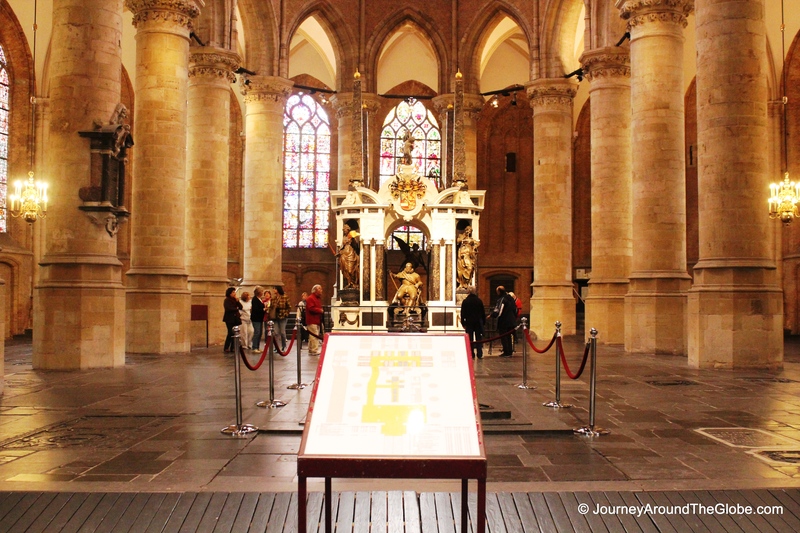 Many famous Dutch citizens and royal members were buried in this church including Hugo Grotius. The church is huge inside but rather a simple one with no grand alter or eye-catching ornaments. The stained-glass windows are also beautiful to look at. But the Mausoleum of PRINCE William of Orange, the FOUNDER of Dutch independence, in the back (1st to be buried in this church) is the focal point of this church. The tomb is nicely decorated with marble pillars, coat of arms, 4 female figures on the 4 corners, and then an image of the lying, dead Prince in the middle. New Church is also located in Hugo de Groot Markt, facing the Stadhuis. The church is open from Monday to Saturday 9-6pm. It is 3:50 euros to go inside, which covers entry to Old Church too. 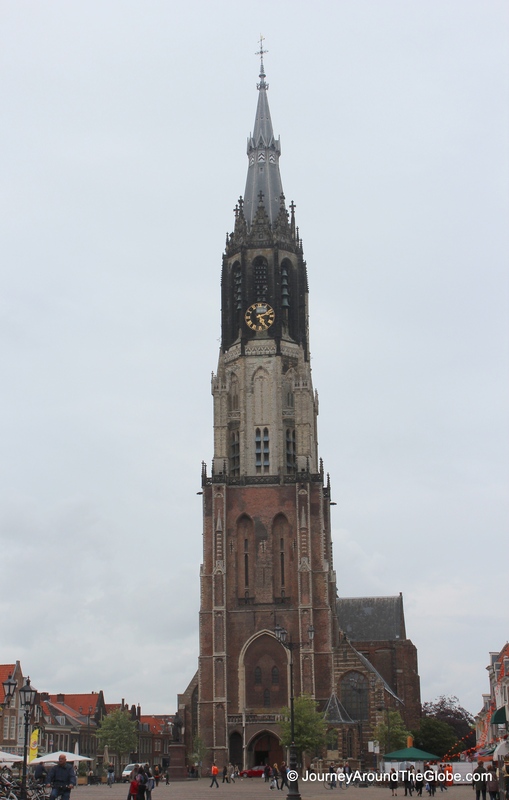 4) OLD CHURCH (OUDE KERK): This Brabant-Gothic style church is Delft’s oldest church, being built in 1246. This looked very similar to the New Church, especially its floor, organ, seating arrangement, altar, and the stained-glass windows. This also houses tombs of famous Dutchmen including famous Delft painter Johannes Vermeer (1632-1675). All the way in the back is the tomb/monument of Lieutenant-Admiral Piet Heyn, which is there since 1639. The most INTERESTING FEAUTRE of this church is that it’s 75 meter high brick tower, built in 1350, LEANS about 2 meters from the vertical. During the construction, it became apparent that the base soil was not strong enough to support the building, so the church began to lean. Eventually they had to compensate for the tilt by building counter curves on the upper part of the tower. on City of blue and white – Delft, the Netherlands | Journey Around The Globe today and I often do research daily on the subject of compare van insurance. Lovely shots! I’ve been briefly to The Netherlands – years ago. I’d love to go back. Thanks so much for stopping by my blog the other day! What a beautiful place! Would enjoy visiting there someday.